Are you looking for a quality carry-on that makes it easy to organize the items you need for a few days out of town? 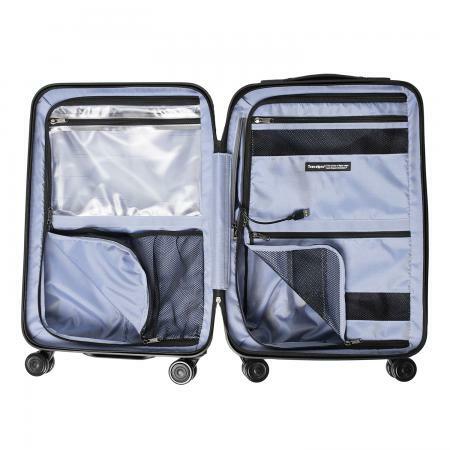 If so, the Travelpro Crew™ Hardside Spinner in carry-on size might be exactly the piece of luggage you need. This sturdy, packable bag is easy to maneuver and is perfectly sized to hold everything you might need for relatively short trips. As a frequent business traveler, I am always on the lookout for quality luggage that will hold up to the demands frequent, quick-turnaround travel. With that in mind, I was really excited when the Travelpro team invited me to review their 21" Crew Hardside Spinner bag. All of my other carry-on bags are soft side luggage, but I have been interested in trying a hard side bag for a while due the various benefits associated with this type of suitcase. I have to say that I am highly impressed with this particular suitcase. Having never used a hard side bag before, I expected it to seem heavy and be harder to manage than my soft side luggage pieces, but that is not the case at all. This particular bag weighs just 7.4 pounds, so it isn't prohibitively heavy at all. It is just as easy to roll and maneuver as any other carry-on size bag I have ever used. It's also very easy to roll in any direction, thanks to its eight MagnaTrac® spinner wheels. The handle stops at multiple lengths (38", 40", ad 42.5"), so it's easy to find the perfect level of extension for to maximize your comfort when pulling the bag. This bag makes easy work of keeping packed items organized due to the fact that the inside features two zipper compartments separate by divider panels. I most commonly take business trips that include two or three days of on-site work at client locations, and I was able to easily fit all of my professional apparel on one side and my casual evening attire and workout gear on the other side. The built-in zipper compartments and mesh pouches are ideal for holding toiletries and delicate items for a trip of this duration. This bag also has several extras not found in lower-end luggage, including a pocket designed to hold a portable battery connected to an external USB port to help you keep your phone or tablet charged while you're waiting on your next flight or your driver. Additionally, it includes a built-in combination lock that meets Transportation Security Administration (TSA) requirements. Its easy to set the combination to any pre-set code you prefer, so you can help keep your belongings secure without having to keep track of a luggage key. While I have only used the bag a few times so far, it's easy to see that the polycarbonate hard shell is sturdy and provides extra durability versus soft side luggage. Sturdiness and durability are of critical importance no matter what kind of travel you do. Lifting your bags in and out of overhead compartments on airplanes puts it through a lot of wear and tear, as does checking your luggage or stowing it for transport via any other means of transportation. This particular piece of luggage is an ideal option for short trips or to complement larger pieces for longer outings. If you're looking for a suitcase for short duration business trips or weekend getaways, this bag is an ideal option whether you are traveling by plane, train, bus, boat, or automobile. If your travel plans include longer getaways, check it out in combination with Travelpro's full line of hard side luggage. In addition to this 21" bag, the brand also offers pieces in 22", 25" and 29" sizes, each packed (no pun intended!) with great features and covered by the manufacturer's limited lifetime warranty. Note: The author received a sample of this item for review purposes. The opinions provided here are her own.